Having a PC is one thing but maintaining its operating system is entirely another different issue, one of the core problems of windows 10 is frequent updates by Microsoft which some users are bitterly complaining, well some updates comes with a great handy feature while other updates comes with a bug and might make your PC slow or even create another scenario that isn't welcome. Some of the usual complains of users is that the operating system is actually consuming data unlike its counterpart windows 7 or less. because the rate at which the system processes it program is far better than the older OS. What is a metered or Unmetered Connection? Well to answer this question, let me use a simple language that we both understand here, metered connection can be regarded as a limited connection while unmetered connection can be said to be as a connection that is unlimited. When you buy data from your network subscriber and they allocate a certain MB/GB to you with a specified timeframe, then this is a metered connection but for instance your using a wireless network connection to browse, then you don't have to worry about the data or the timeframe, this is unmetered connection. 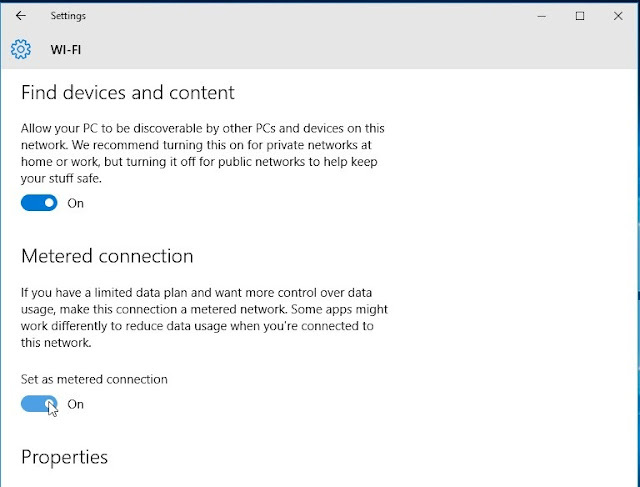 The only benefit you will derive when you set up your connection to metered is that you PC cannot necessarily consumes your data much, because it cannot updates windows and moreover some apps might cease to function consuming your data. My recommendation here is that if your browsing with your internet service provider (ISP) i.e. your using a modem or any other portable hotspot then i urge you enable your connection status to metered connection but if there is no need to to disable your metered connection on wifi unless if you don't want to receive microsoft windows updates on your PC.